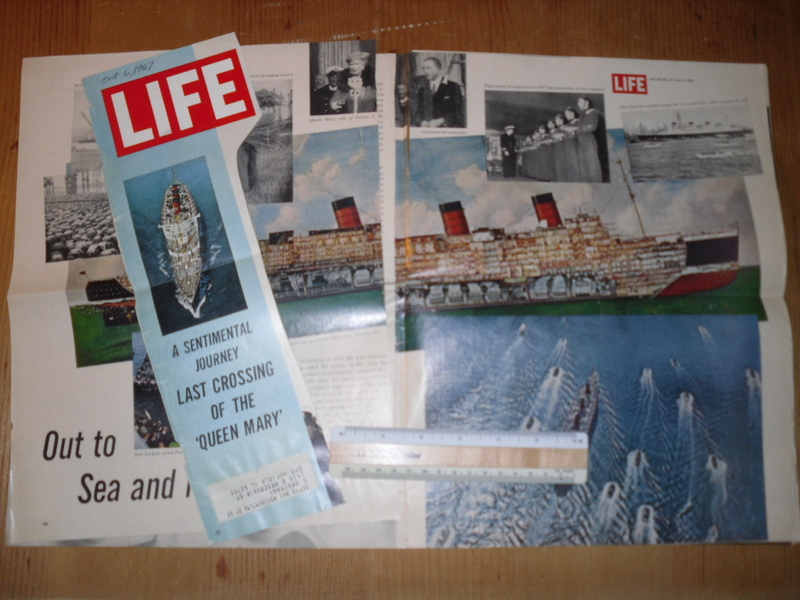 Cunard Line: Queen Mary Life Magazine article. Out to Sea and into History. 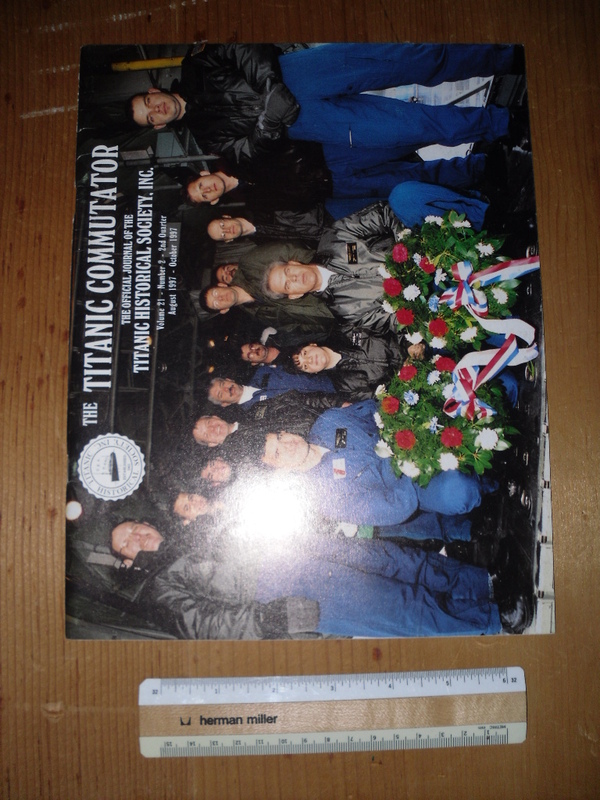 Clipping out of the life magazine that celebrated the life of the QM and her retirement from Cunard. Filled with all sorts of anecdotal information and pictures. She was on her way to Long Beach to start a new static life. From the FOB collection. Amazing AE line table cloth. 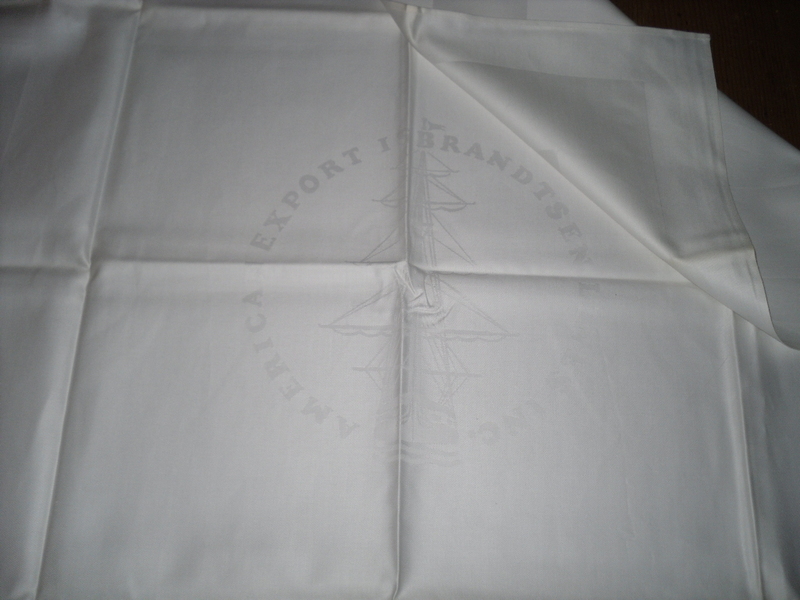 All cotton and proudly made in America (of course) this is a gorgeous table cloth. The sailing ship line logo is woven into the pattern and surrounded by Americian Export Isbrandtsen Lines Inc.This one is approx 36×36. At one time this was cleaned, folded and never used again. I imagine there were lots of these left in a warehouse when the fleet was mothballed and eventualy sold. 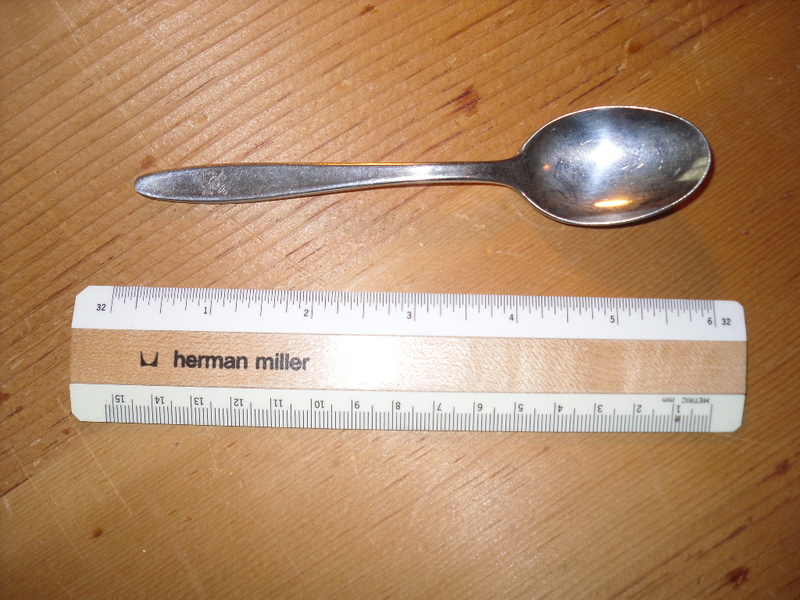 This is in great shape and shows very little if any wear. US Steel Magazine Janurary 1937. 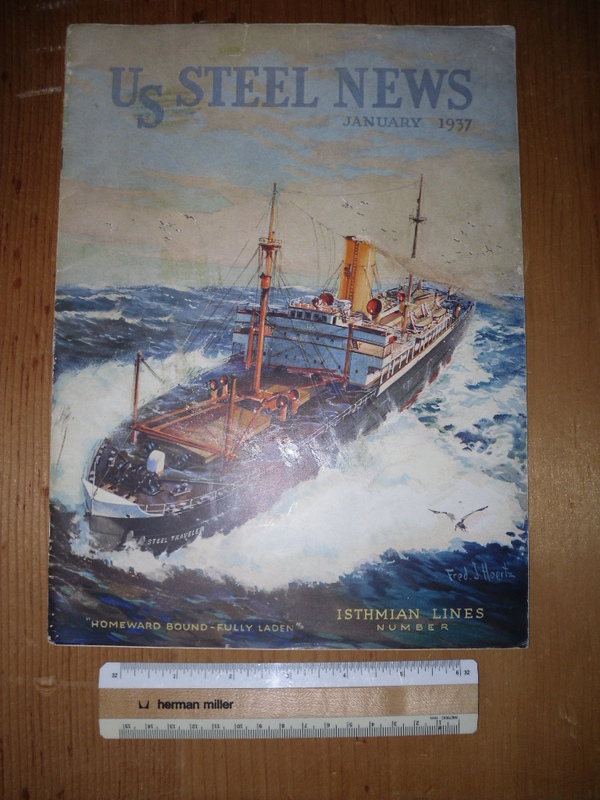 Nice little US Steel publication … mostly about different aspects of the Isthmian fleet that carried cargo all over the work. 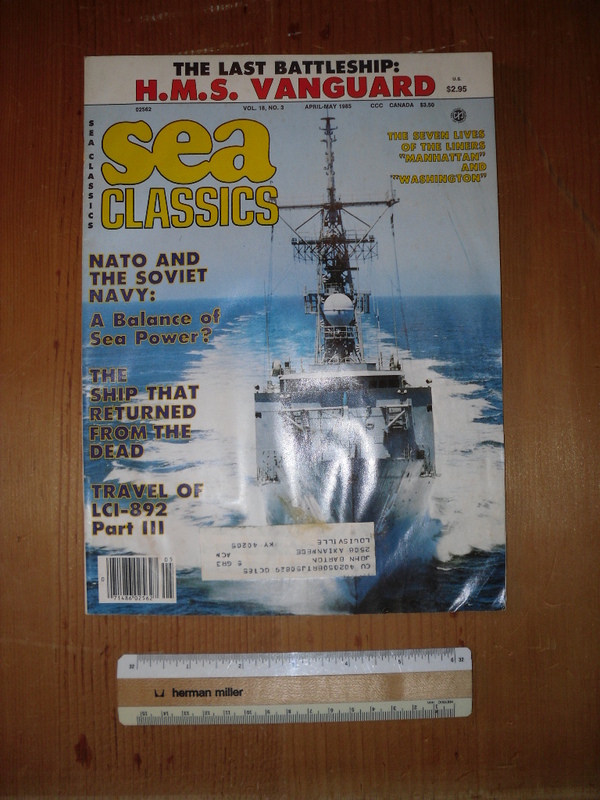 Excellent Fred Hoertz painting of the “Steel Traveler” on the front cover and Horetz painting of the fleet on the rear cover. Great multi storied issue … about 15 pages are dedicated to a great article on the America. The other big story covered was the THS convention that was held on the Queen Mary …. lots of folks came in period attire .. and fun was had by all! This is full of great photos … as most of the THS publications are. 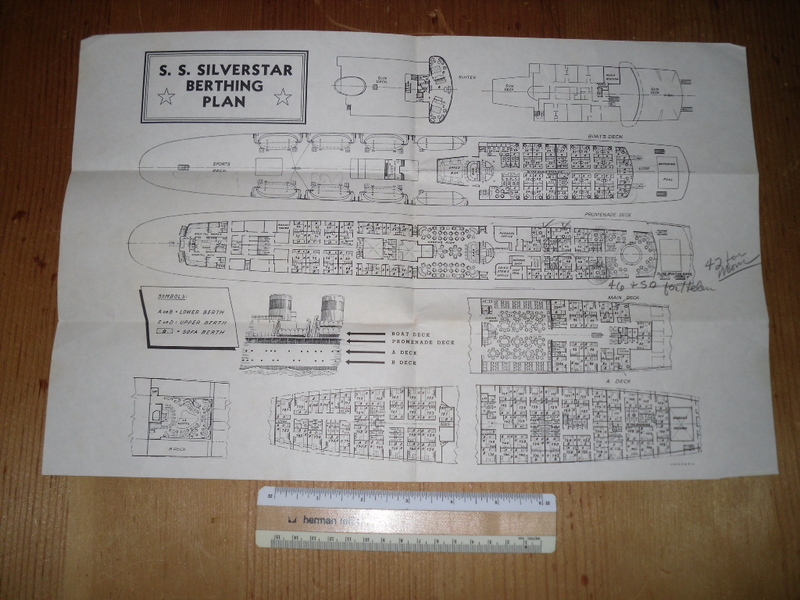 Cute little deckplan … for the puggy little Silverstar. She started life in the Military … and after WW2 was converted into a little cruise ship operating off the east coast of the US. She was pretty utilitarian and somewhat successful in her own way. A note tells us Mom stayed in cabin 42. The Silverstar was such an odd duck…You do not see much for her. 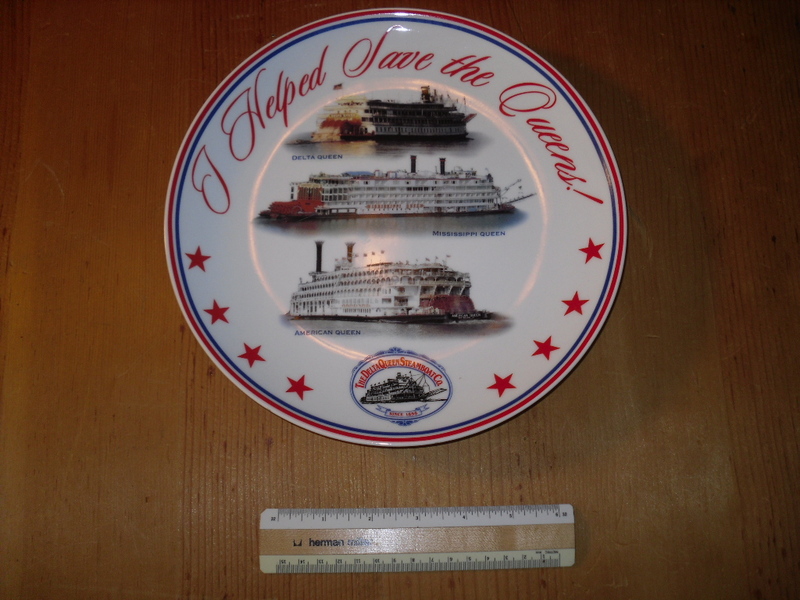 Cunard line: Maddock China crescent dish: Restocked! 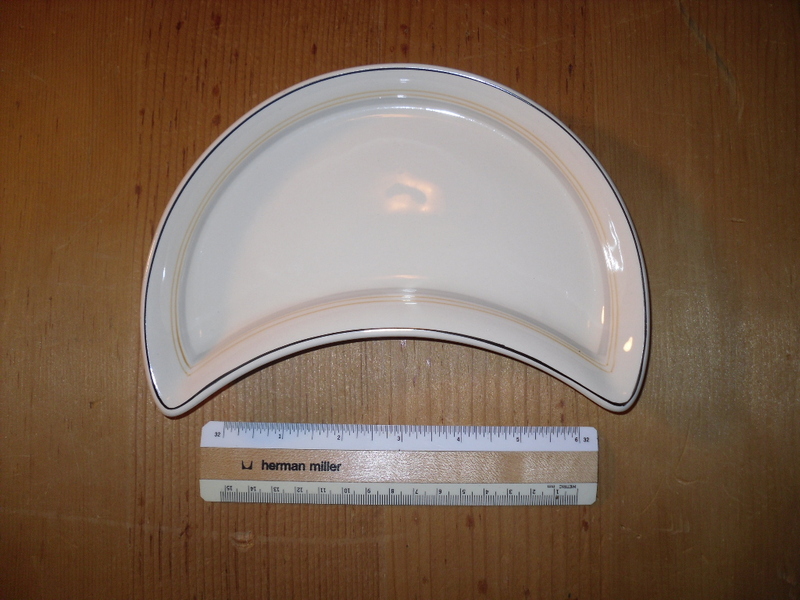 Cunard Line: Maddock China crescent shaped dish: restocked! 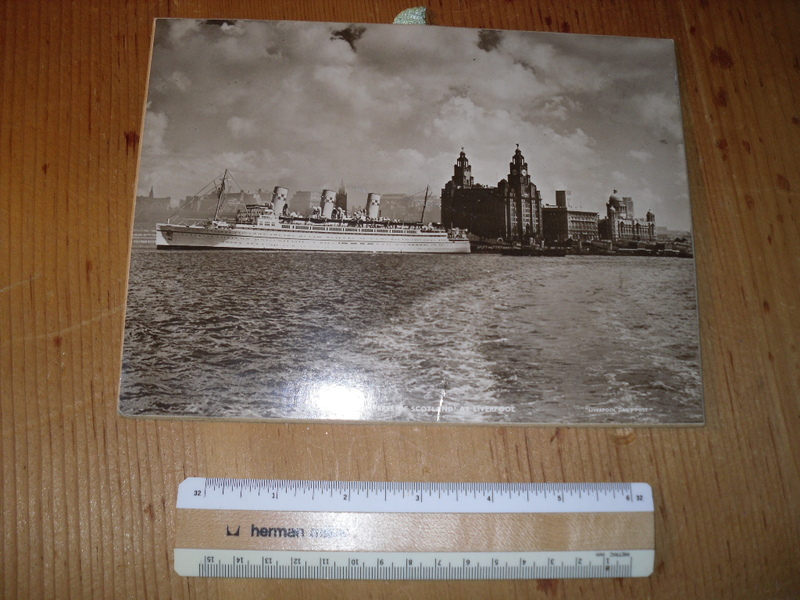 Maddock was the staple of all Cunard china patterns in the 50’s and 60’s. Very durable … it could tolerate the hot temps of the ships scullery equipment. 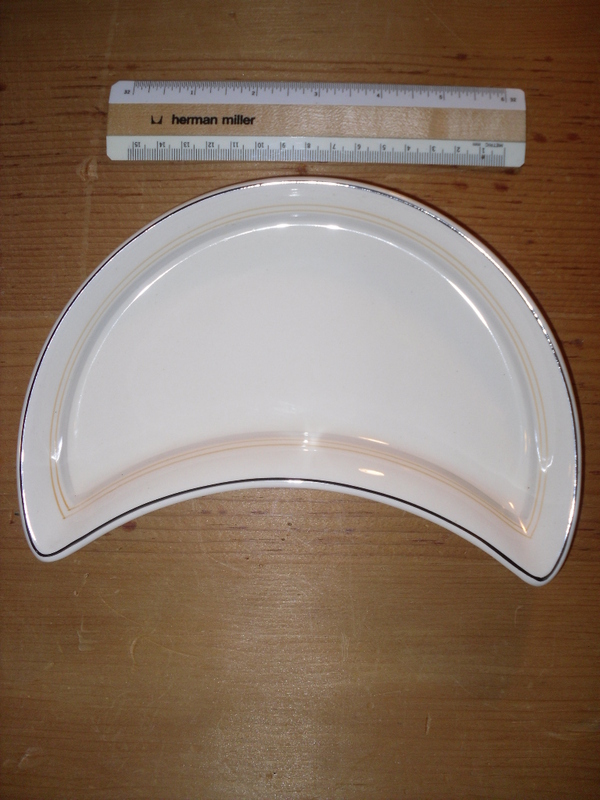 Best thing about Maddock for collectors… each piece was dated when it left the factory … from 1967. Several available. These are always a treat … of course the best article in the one is written by FOB .. and is titled ” the seven Lives of the Manhattan and Washington”. Frank’s delight always shows in writing and the11ish page article just glows for these little ladies. Born out of the depression, they sailed in the 30’s and saw heavy war use in the 40’s. After the war, there was some (but little austerity use).. and both ships spent most of their time remaining time slowly rusting in the reserve fleet. The magazine does have some page crinkling. 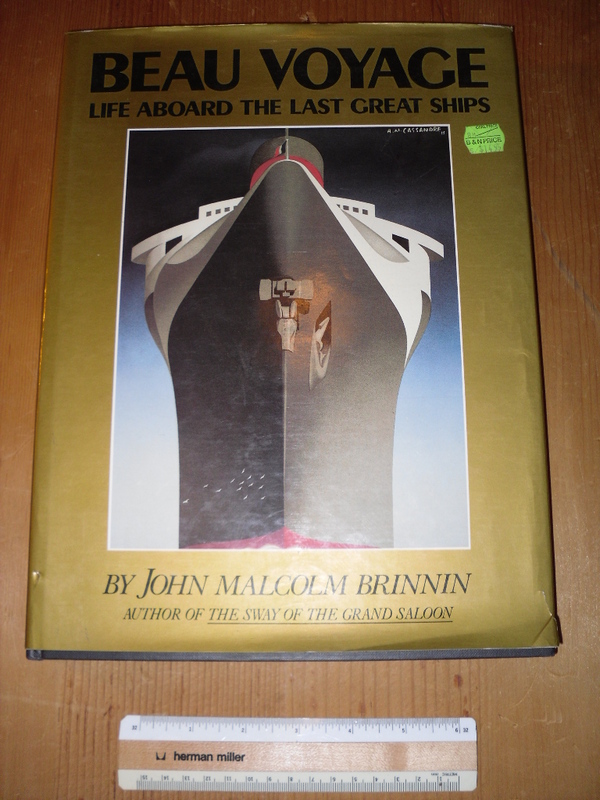 Directly from a library of one of the Cunard ships … this is a nice little book. 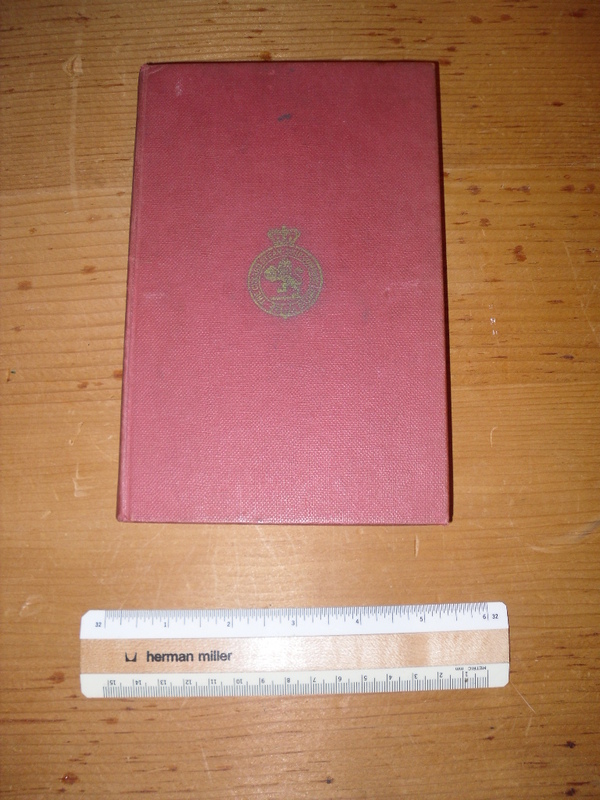 The Cunard line crest is printed on the cover and there are a few “date stamps” inside. 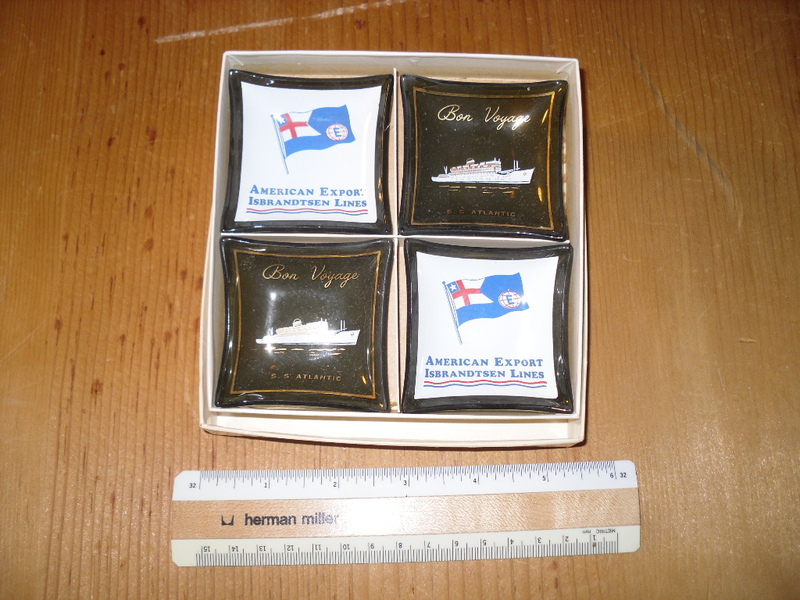 American Export Lines: SS Atlantic ash/pin tray 4 pack. 4 cute little glass trays packed nicely in thier orginial souvenir box. The Atlantic sure isn’t a very popular liner … she never have the fanfare of the larger ships; but she did survive a very long time as the SS Universe. She ended her days on the beaches of India becoming recycled resources for the local economy. 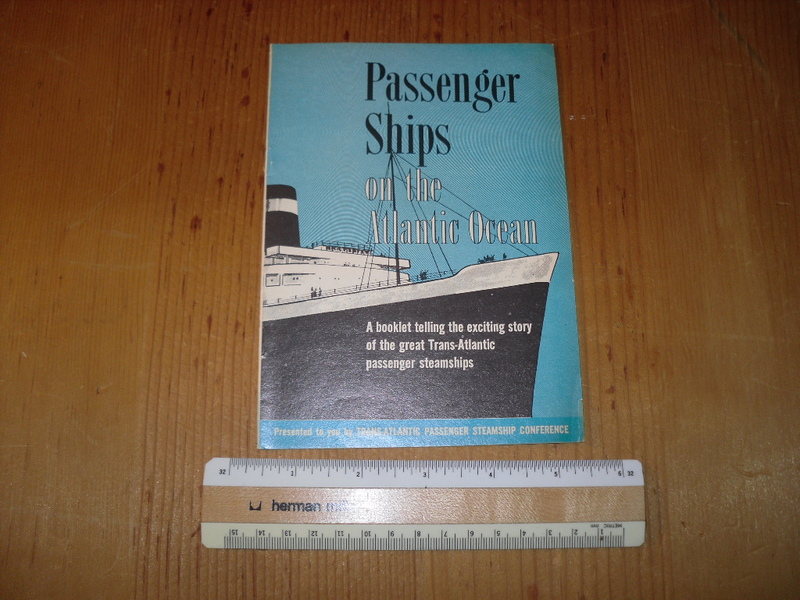 Nice little booklet published by the Trans-Atlantic Passenger Ship Conference … in 1968. This great little booklet ws an obvious attempt to drum up business …. which was certainly waning by 1968 . Gret little history in a nutshell format … about 12 pages in length. Good solid shape with some age browning. 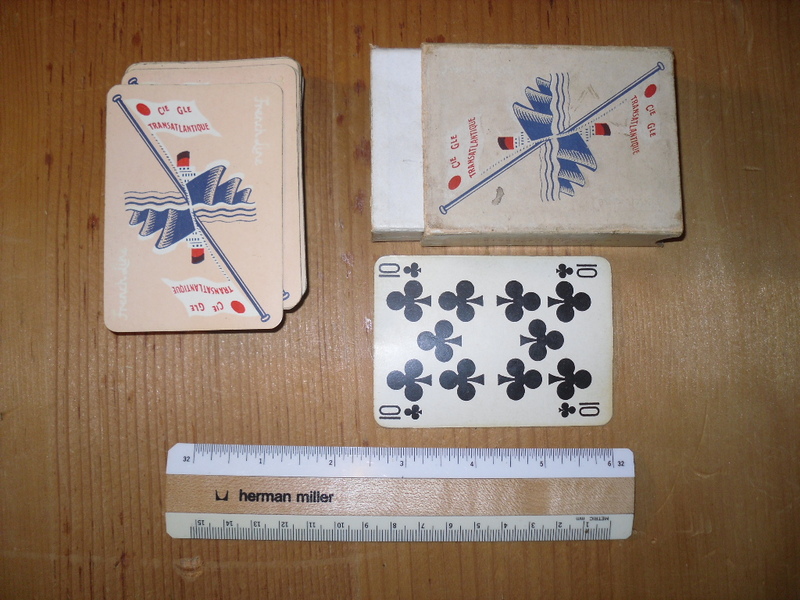 Interesting deck of French Line cards .. sets of 8 cards .. Nine’s through aces. Not sure what cad game this would have been for … nothing I ever played before. They sems to be well used … I”m sure they provided lots of entertainment! Also comes with the well worn box! Oh, probably Peter Kengo is the only person that can tell you exactly hom much I loved the little Ivernia/ Franconia. She was such a special little Canadian lady. 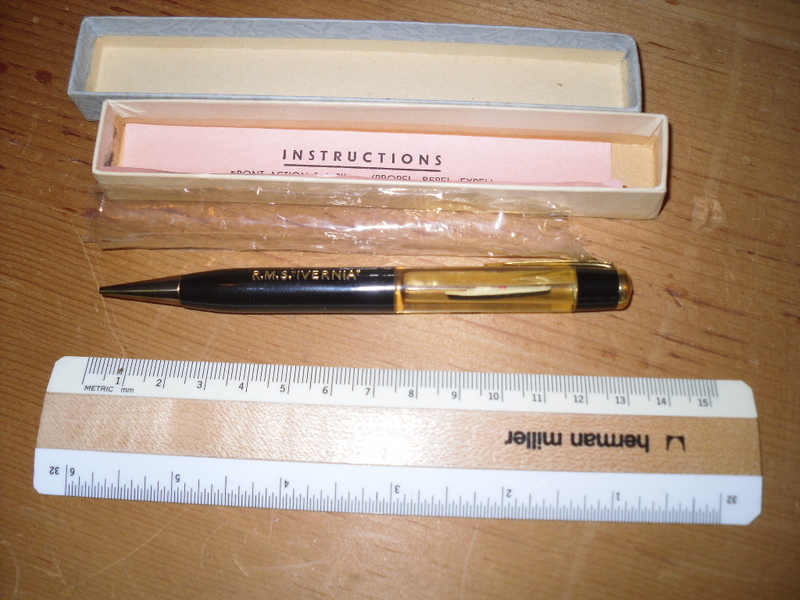 Great floaty mechanical pencil … of course a gift shop item. I don’t think the little “Ivy” floats anymore (needs oil refilled)… but all else is excellent w/ lead! Orginial box and instruction sheet. 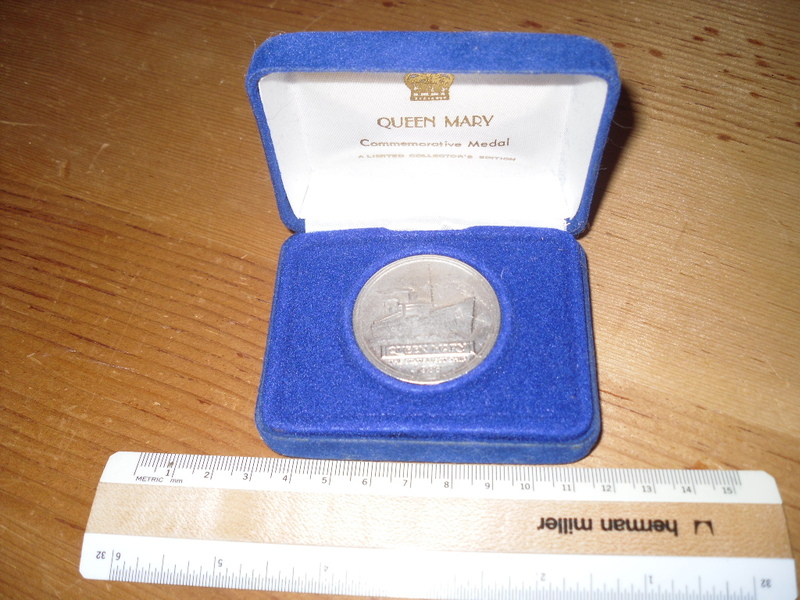 Nice QM commerative coin … probably from a Long Beach onboard gift shop. Very darling blue velvet case. 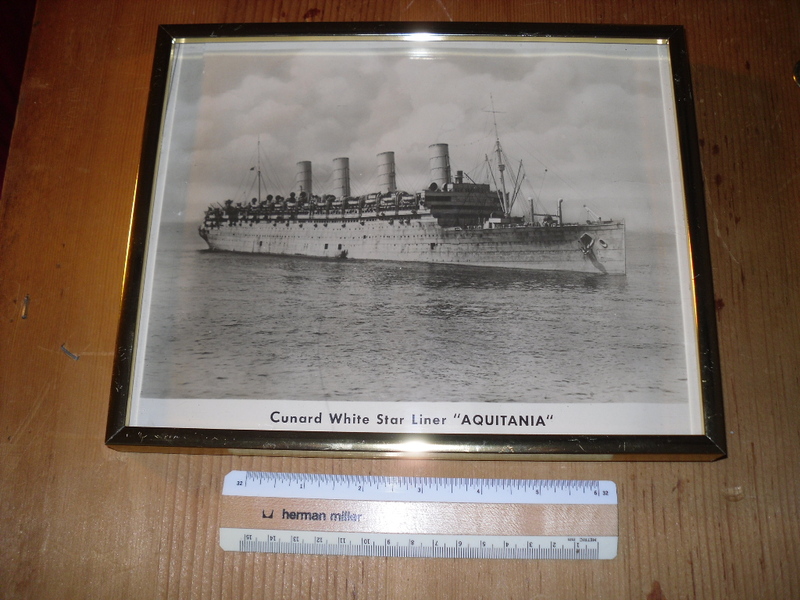 Nice WW2 picture of the Aquitania. 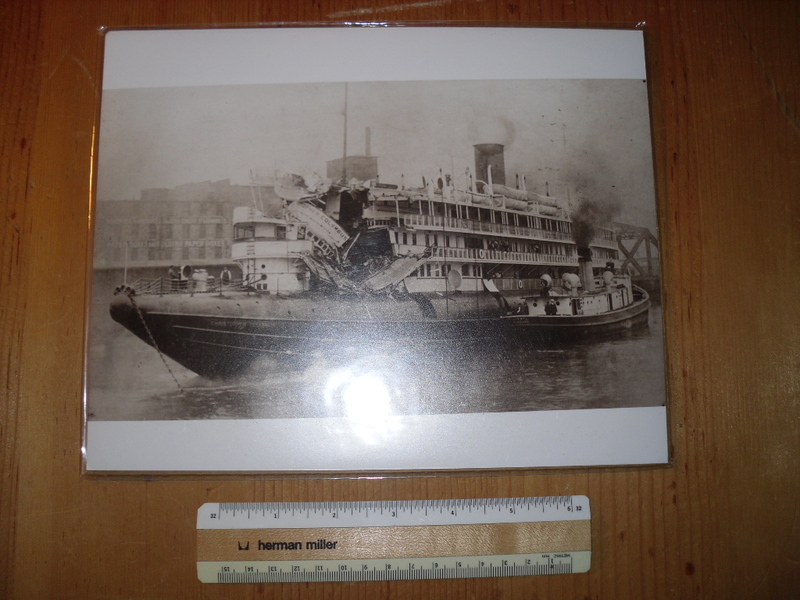 From 1914, she survived both wars and gave the company spectacular 4 funneled service. She was also the last 4 funneled ship … and after hard use and minimum post WW2 austerity refurbishment.. went to the scrappers in 1950. I think this is a modern “nostalgic” photo. 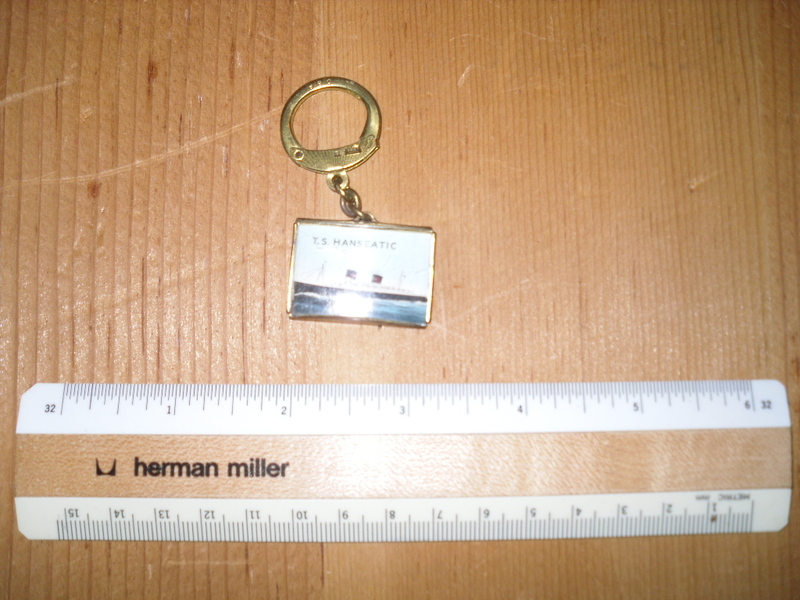 Great little keychain … would have been offered out of the onboard giftshop. This cute little bugger could easily be converted into a stylish necklace! I just loved the Hanseatic … you could always see the nuances of her Brittish CP interiors behind the newer German artwork and furnishings. 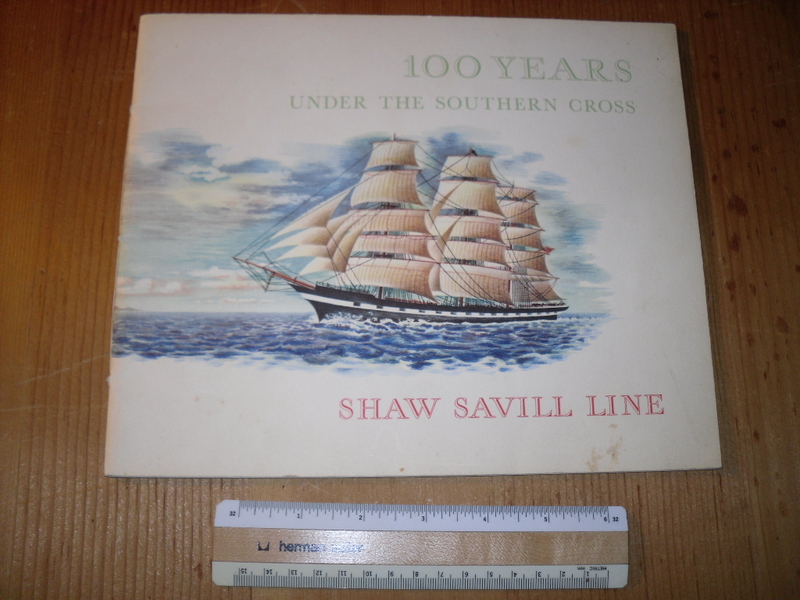 Nice line published history booklet for Shaw Savill. 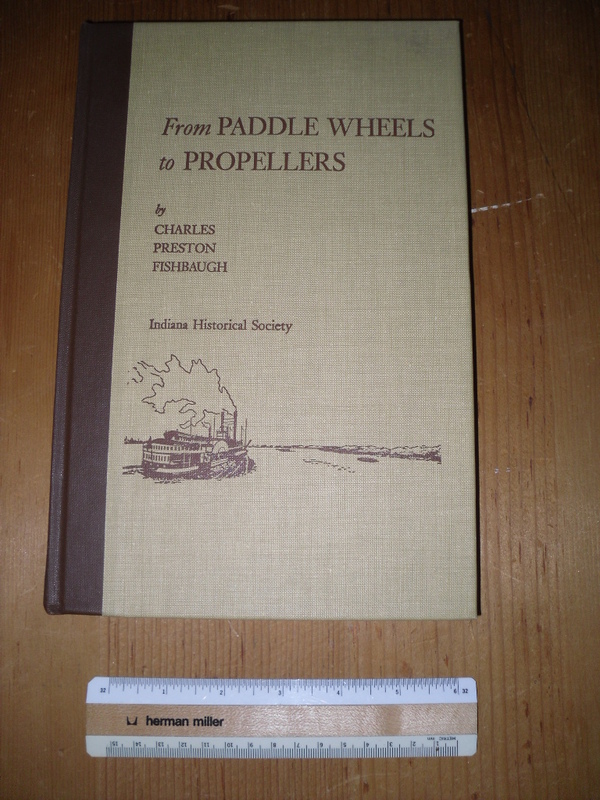 Filled with the companies history, drawings and images. Heavey stock paper and in excellent condition. The Southern Cross was a trendsetter and sure had a long life under other owners cruising out of Miami. Nice super heavy stock portrait card for the EOS …. shown in Liverpool harbor. This was probably a gift shop item available for onboard purchase. The EOJ>EOS> Hanseatic was one of may favorite ships. A smelly smokey fire in NY harbor sent her to the scrappers. This card does have an unfortunate crease line … its only flaw! 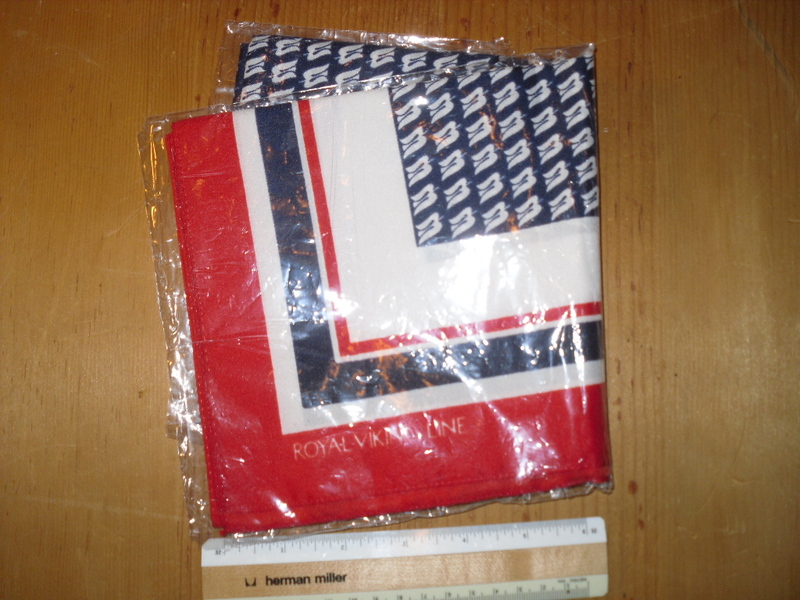 A great in the package RVL scarf. I really loved the RVL ships … they had such nice modern lines. The scarf looks like it was never opened or worn… excellent condition! Still stylish for modern cruising! 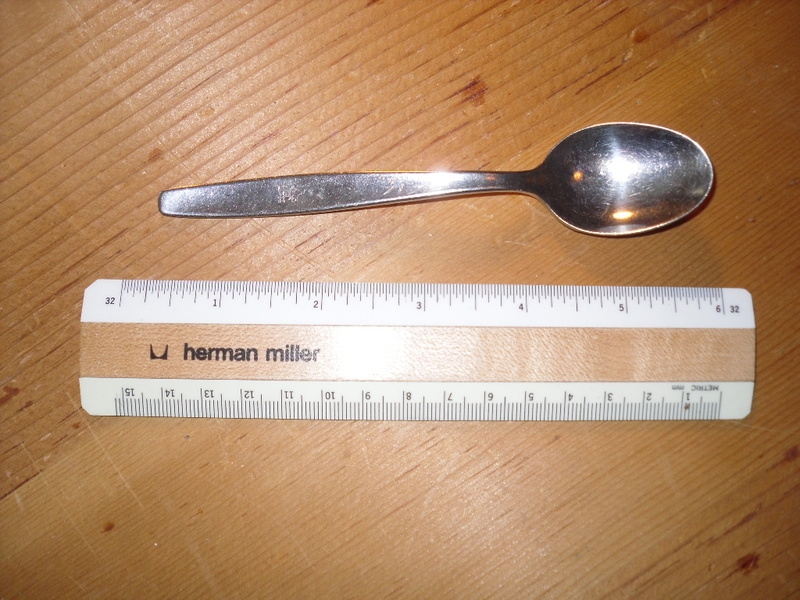 Nice stainless steel spoon from a NDL ship with a stamped key and anchor logo. Probably from the 60’s or 70’s. typical use and scullery wear and tear!